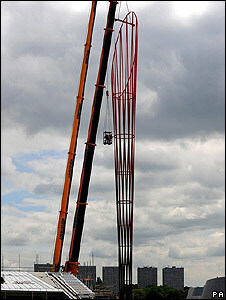 The final part of the tallest piece of freestanding public art in the UK has been put into place. 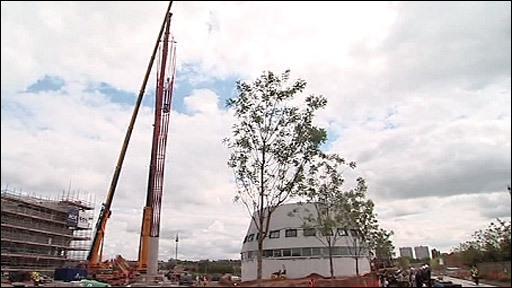 Aspire, a 197ft (60m) steel tube, stands over the University of Nottingham's Jubilee campus. University officials said the sculpture was three times the height of the Angel of the North and 8m (26ft) taller than Nelson's Column. The £800,000 structure, paid for by an anonymous benefactor, is designed to represent academic ambition. It was named following a competition involving the university's 6,500 staff and 36,000 students. University spokesman Jonathan Ray said: "It represents limitless ambition, the power to change your life through education. "It also says something positive about Nottingham and it reminds people there is a lot of good stuff about the city. "A few years ago we had a hard time but this is about the future and a really positive vision for the city." Aspire was designed by architect Ken Shuttleworth, who worked on the new Wembley Stadium and the Millennium Bridge. The spire's steel lattice design in part reflects Nottingham's industrial heritage, particularly its lace making for which it was a major centre. Each metre of the sculpture represents one year since the university gained its royal charter. It exceeds the height of the previous holder of the UK record for the tallest piece of freestanding public art, Manchester's B of the Bang, by 4m (13ft). Aspire is mounted on an 8m (26ft) concrete plinth and will be officially unveiled on 14 July. It will then be illuminated at night.